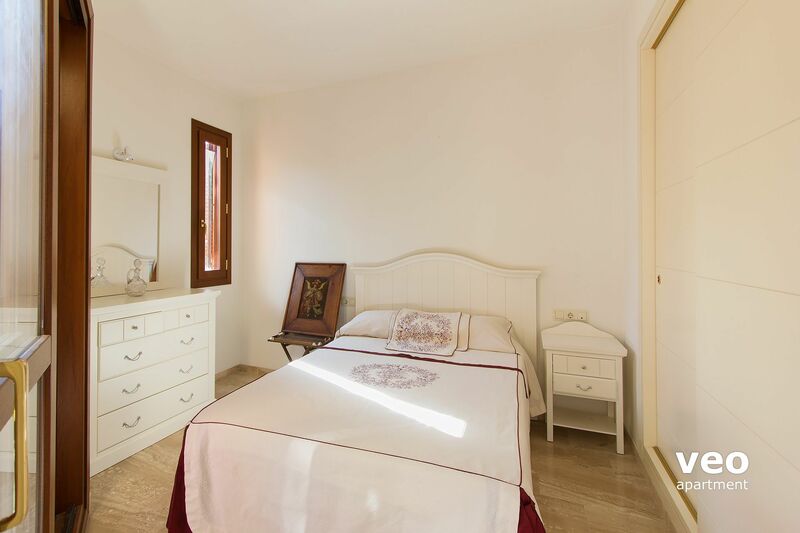 Exklusive 1-Schlafzimmer-Wohnung im Zentrum von Sevilla, in der Nähe des Rathauses. Diese Ferienwohnung gehört zu einem restaurierten "Casa Palacio", welches Anfang des 20. Jahrhunderts im Stil des Plaza de España gebaut wurde. Die Wohnung erstreckt sich über 3 Etagen, mit dem Eingang auf der zweiten Etage des Hauses. Auf der Eingangsebene der Wohnung befindet sich das Wohnzimmer und die offene Küche. Eine Treppe führt in die zweite Ebene mit dem Schlafzimmer und dem Badezimmer. Von dort führt eine Wendeltreppe auf die Dachterrasse, die mit Gartenmöbeln ausgestattet ist. Von der Terrasse haben Sie einen herrlichen Blick über die Dächer Sevillas. "Très belle appartement et très situé"
Appartement très bien situé dans le centre de Séville. Tout les équipements sont disponibles. Magnifique terrasse qui donnent une vue magnifique sur Séville. Très bon contact avec l agence et disponible pour garder nos valises après notre départ , ce qui nous a profité de pouvoir ce baladé tranquillement l après midi en attendant notre vol. Je conseille cette appartement et cette agence. 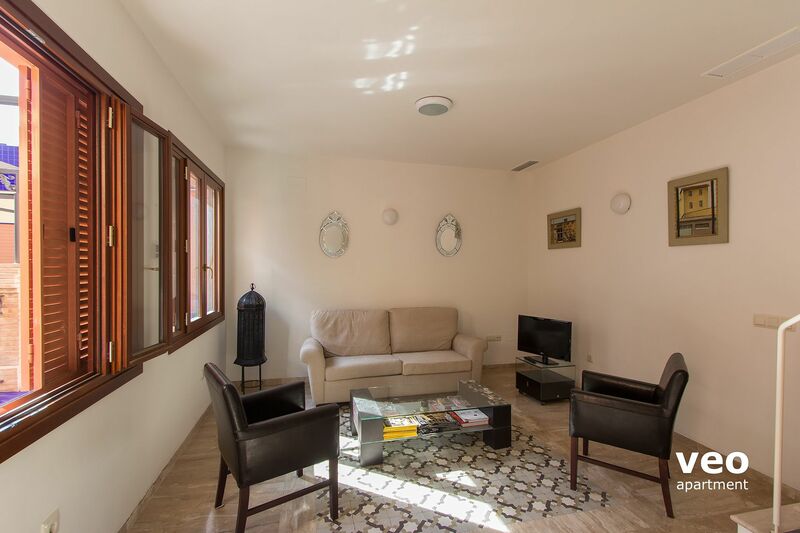 "Excellent apartment with sun terrace near the Cathedral"
Beautiful apartment over three levels. We were met by Ludovic who explained the apartment and the locality to us, recommending cafes, bars and where to shop for food. 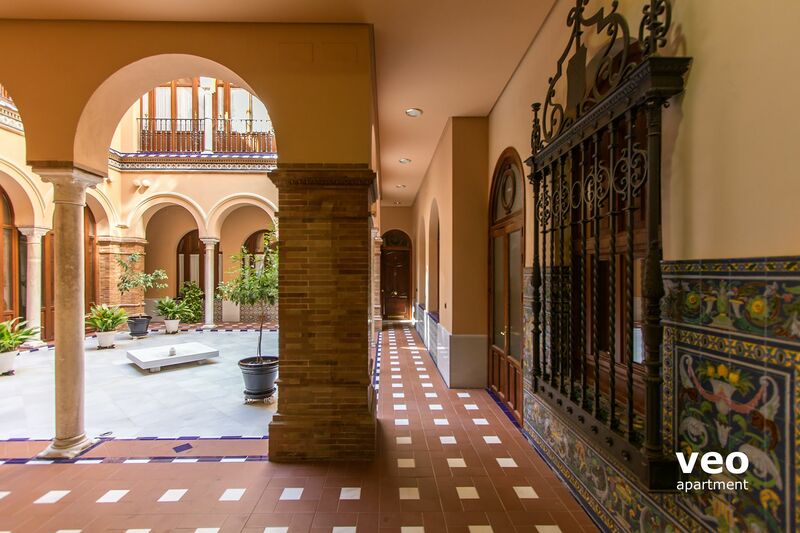 The apartment is spacious and spotlessly clean in a beautiful building around a courtyard. 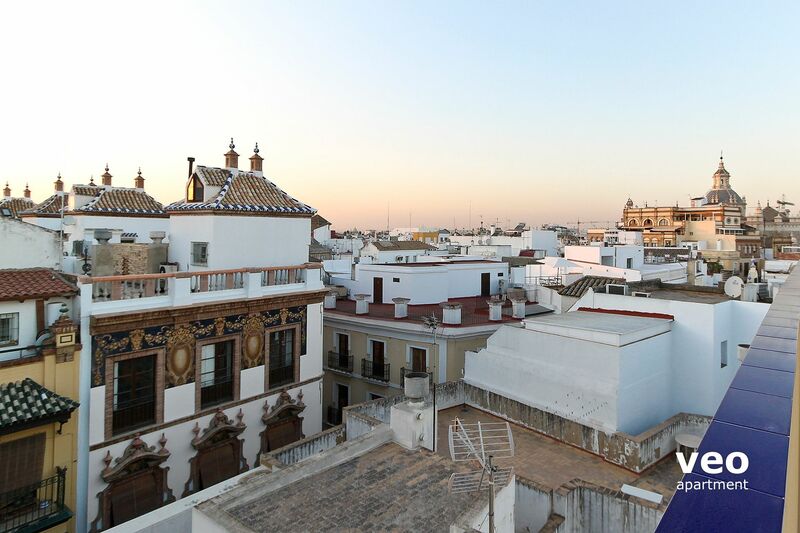 "Most beautiful terrace in Sevilla!" I really liked the apartement! 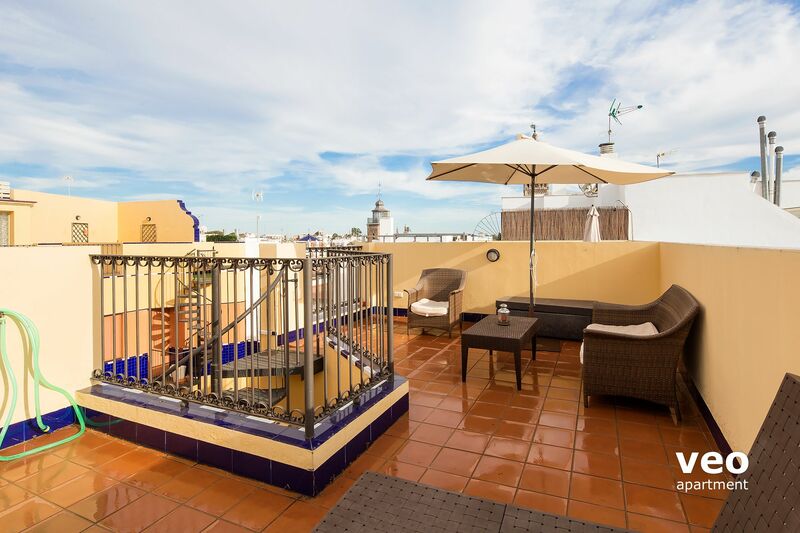 And if i'll come again to Sevilla i'm looking forward to stay in this apartment! "Très bien situé et agréable à vivre avec le charme de la terrasse." Bien agréable et confortable dans l'ensemble sauf pour le convertible dont le matelas est un peu trop mou. "Well organised and good value"
"Clean, tidy and well presented apartment. 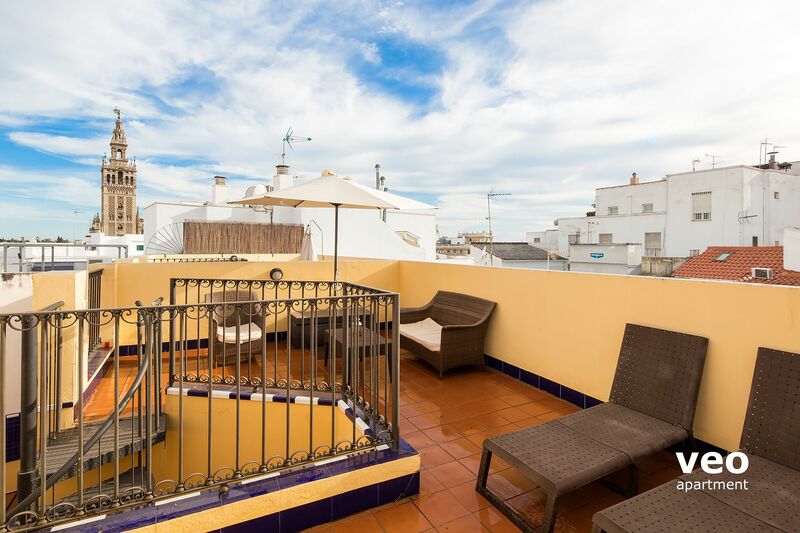 We certainly made use of the roof top terrace!" Great location within 5 mins walk of the Cathedral. Beautifully presented apartment and the sofa bed is rather comfy. The roof top terrace was our favourite and the views were incredible! 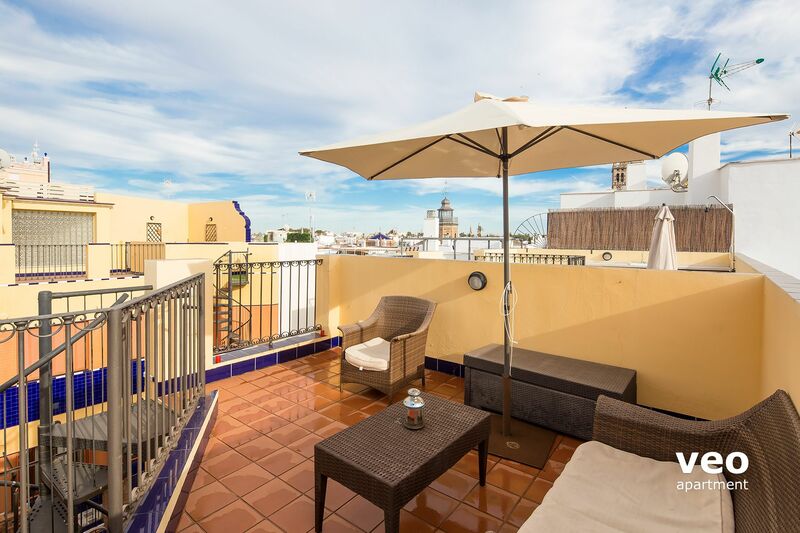 "EXCELLENT WAY TO EXPERIENCE SEVILLA"
My wife and I had a fantastic stay at Parajitos. Living directly in the city provided an excellent starting point for our everyday adventures. The apartment was cozy and provided every amenity needed. I have already recommended these apartments to others and I would certainly consider staying again. "Well-appointed one-bedroom apartment with a stunning rooftop terrace." Really enjoyed our stay in this beautiful, well equipped apartment. Loved the roof terrace but furniture (though comfortable) needed a clean. Apartment itself was spotlessly clean and we loved it! The location, being near the cathedral is perfect. 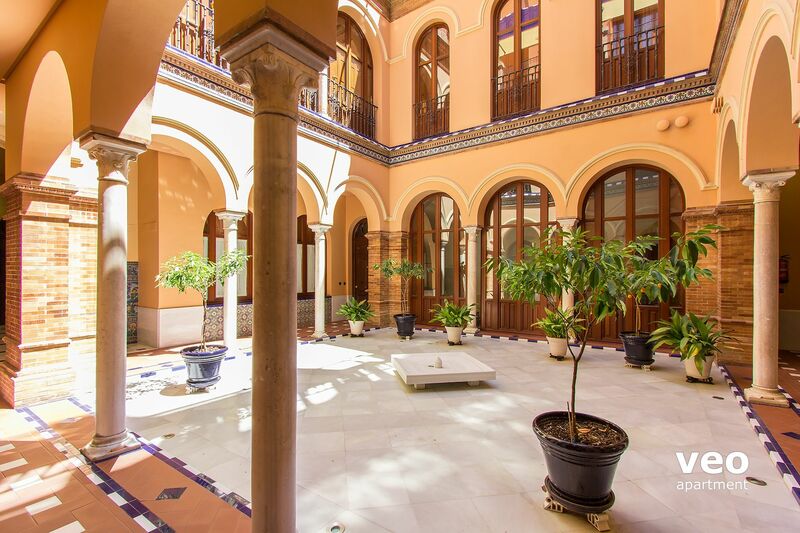 Would love to return to Seville and this apartment. "Appartement très bien placé très calme très propre"
"Es uns sehr gut gefallen"
"Great apartment that added to the holiday experience"
The apartment is lovely and just right for a couple. It's well equipped, with a good layout and was a pleasure to come back to after a hard days sight seeing. The rooftop terrace does feel a bit precipitous to get to on the first encounter the with the spiral staircase, but any adult who can walk can negotiate this with no real problems. Overall, we had mixed feelings about this apartment. 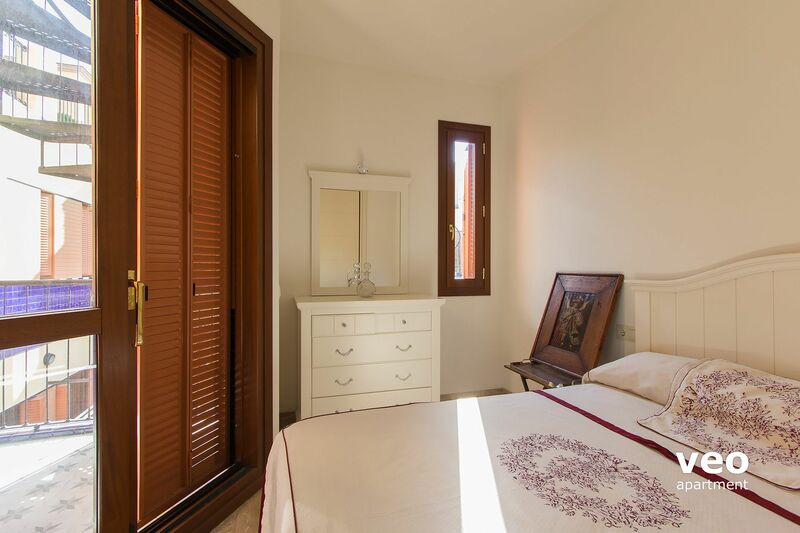 It is in a fabulous location - very near but not in the middle of any of the tourist spots. Walking anywhere was fast and easy and we had tapas and coffee in a really good tapas bar, Bar Estrella, which was at the end of the street. Location can't be beat. I can't really complain about the apartment as what you see is what you get -- and it is probably my own expectations that were not met. The apartment was very clean and and well-maintained and the air conditioning (needed when we were there) was very good. The apartment is on 2 levels and the terrace is on a 3rd, up the spiral staircase.We found, though that the room we ended up using the most was the bedroom, and it's quite small. We found that the living room area is not especially inviting -- very sterile and feels more like a waiting room area than a comfortable space to stay in, so we used it only as we were getting ready to leave the apartment to tour. The patio is the reason we chose the apartment, and in this, I was disappointed. It was too hot during the day and the umbrella that is there is not usable, limiting any use during the day. There was no light that we could find or any candles to use to be able to use the patio at night. We found the seating is too low to be comfortable, but not having any light really meant that we could not use the space at night. If there IS any light, we were not shown it. We would've loved to have used the small lower "terrace", the outside area that leads up to the patio/terrace, but there were no chairs or table. This would've made the outside area much more usable than it was for us. The communication I had with staff was excellent -- everyone was very responsive by email. 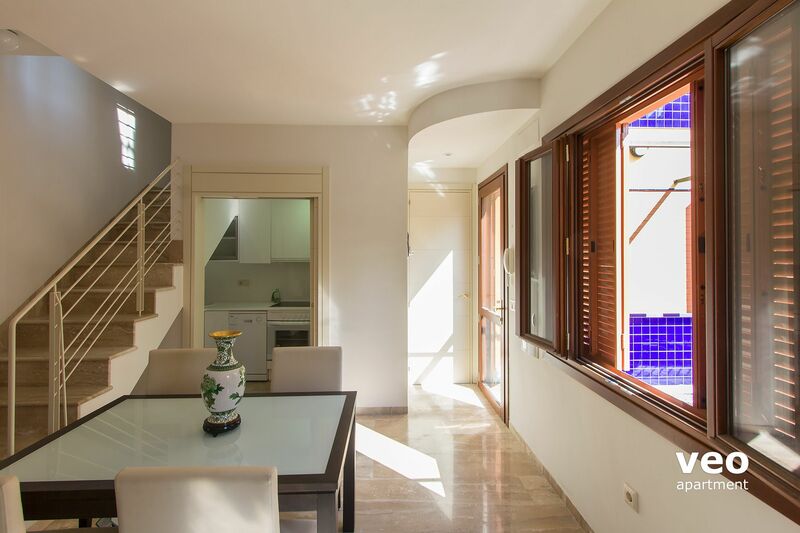 I had been disappointed to find that the actual apartment I initially reserved (Pajaritos 1) was cancelled because of a longterm rental coming up, but the agency was very fair with their communication with me and gave me the opportunity to switch or cancel. The agency representative who met us was on time, but was clearly unfamiliar with the apartment. The questions that we had she couldn't answer. She clearly had no knowledge of any specifics of the apartment which could've made a difference to our general feeling of the place. We noticed that there was water in the washing machine soap dish, and she had no idea whether this was a problem or how to use it. Again, the communication with the agency was professional, the apartment was in good condition and was very clean; the apartment lacked any personal feeling, however, so we didn't ever feel "at home" in it. I'm sure that they would've responded if I contacted them about my concern with the washing machine, but we were there for only 4 days that we didn't really want to spend the time in fixing the things that weren't impacting us that much. Overall, I would recommend it with some caveats -- the most important, I think, is to understand the layout of the place. The second would be to have a representative at the apartment who knows the apartment well so that any questions can be addressed in the initial meeting. Appartement très bien situé dans Séville. Pour 2 personnes l'appartement est idéal, il faut éviter d'y aller en famille à 4 personnes car le matelas du canapé lit est hors d'usage. la cuisine bien que très bien équipée pourrait avoir une cafetière électrique. La décoration est simple, appartement propre et très silencieux. 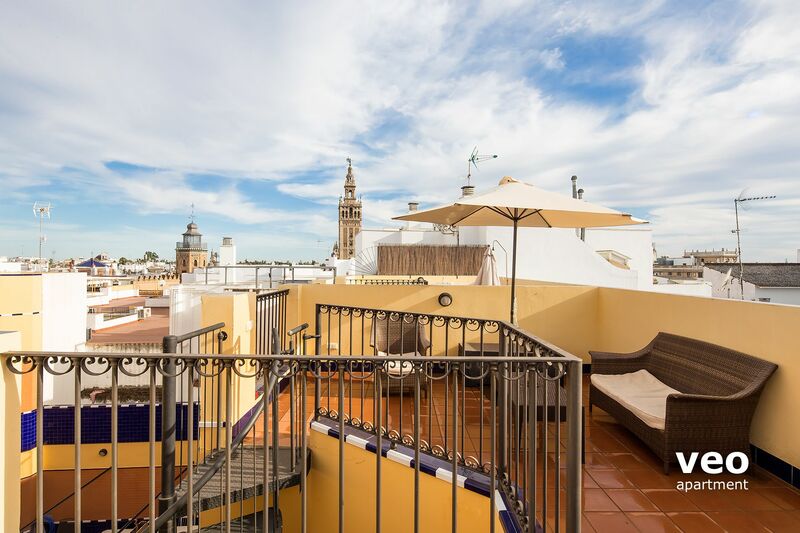 "Dans l'ensemble très sympa et propre"
"Ruhige Wohnung im Herzen von Sevilla mit super Dachterrasse"
sehr ruhige Wohnung, sehr zentral gelegen, funktional eingerichtet. Die Wohung war sehr sauber. Wir haben die Dachterrasse sehr genossen und haben uns rundum wohl gefühlt. Kleiner Wehmutstropfen: das Bett könnte für zwei Personen etwas grösser sein. "Appartement très agréable et merveilleusement bien situé avec un service irréprochable. Merci!" Nous avons passé un excellent séjour à Séville dans cet appartement. Il est agréable, situé au calme et bien sécurisé. La chambre est confortable, le lit large (ce n'est pas toujours le cas) et on dispose d'une très grande garde-robe pour ranger les vêtements. 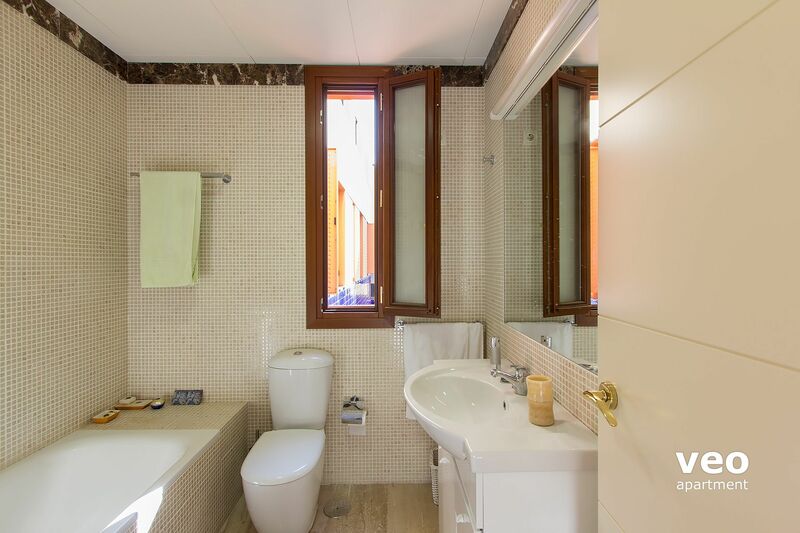 La salle de bains est petite mais fonctionnelle - une cabine-douche serait plus sympa qu'une douche dans la baignoire, mais impossible d'en installer une faute d'espace), la partie séjour avec salle à manger spacieuse et bien aménagée, la terrasse est un charme. On peut laisser les fenêtres ouvertes pour aérer tout en étant en sécurité grâce aux volets ajourés qu'on peut verrouiller. Avis général : très positif !! Nous y reviendrons avec plaisir. "Un piso precioso en un edificio precioso, y una terraza de maravilla! 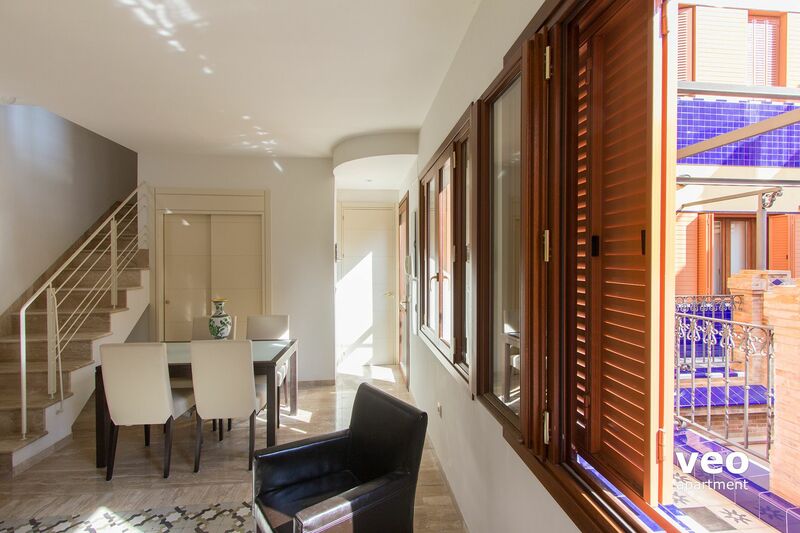 A beautiful apartment and building with an incredible terrace and views." Fenomenal! Muy cómodo, muy limpio y elegante, y muy bien ubicado. Wonderful flat in a wonderful location. Me encanta trabajar con vuestra agencia, es siempre un placer. Todo muy bien organizado y la gente siempre simpática. 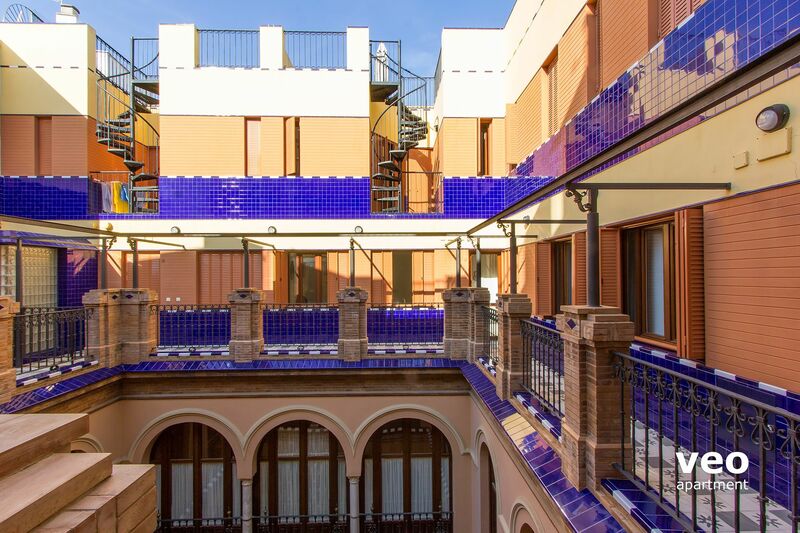 "A Stay with a Twist"
the centre of Seville. So great to be in a quiet apartment and dive into the streetlife in a minute. And the view from the terrace is of course superb! "Quiet comfort in an ideal location"
We thoroughly enjoyed our week-long stay during the second week of February 2015. 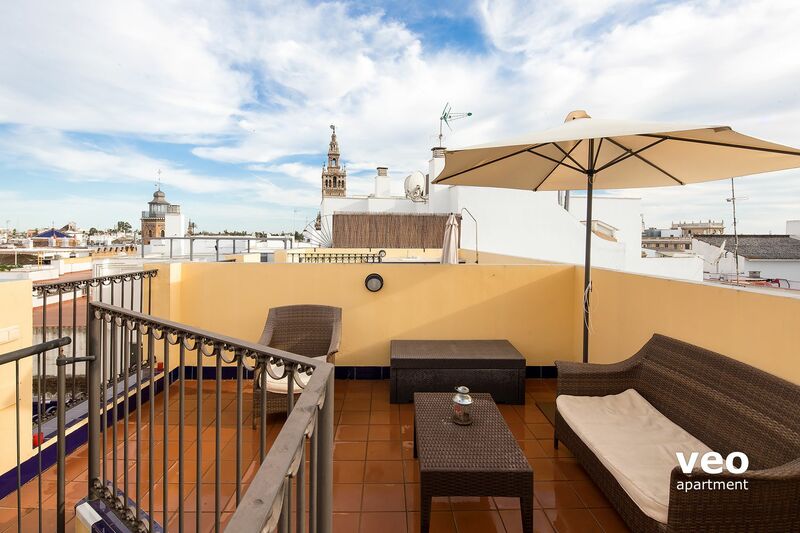 An unbeatable located within walking distance of almost everything you'll want to see in Sevilla, including many wonderful bars and restaurants (and shopping, if you're so inclined). 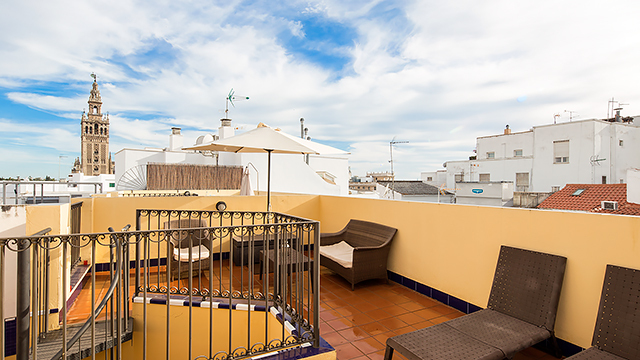 We enjoyed the private rooftop terrace and the views of the city. We wouldn't hesitate to return. 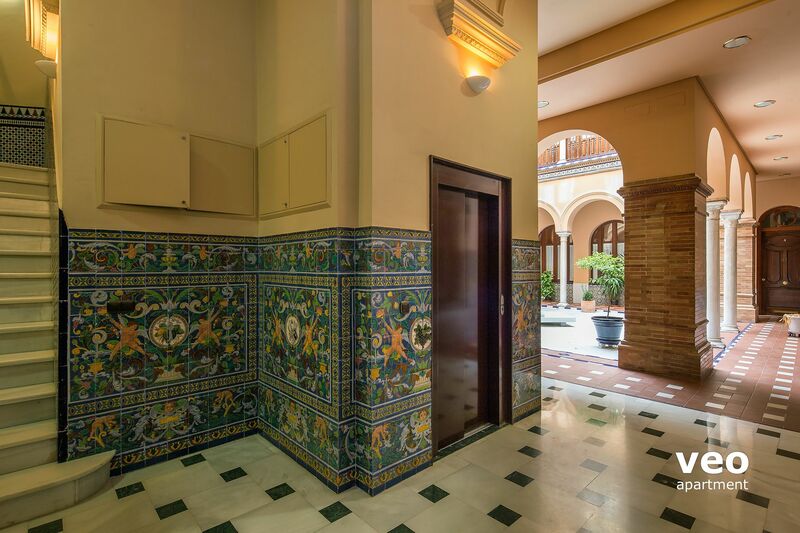 "Un apartamento muy bien situado, a poca distancia de los sitios más emblemáticos de Sevilla." 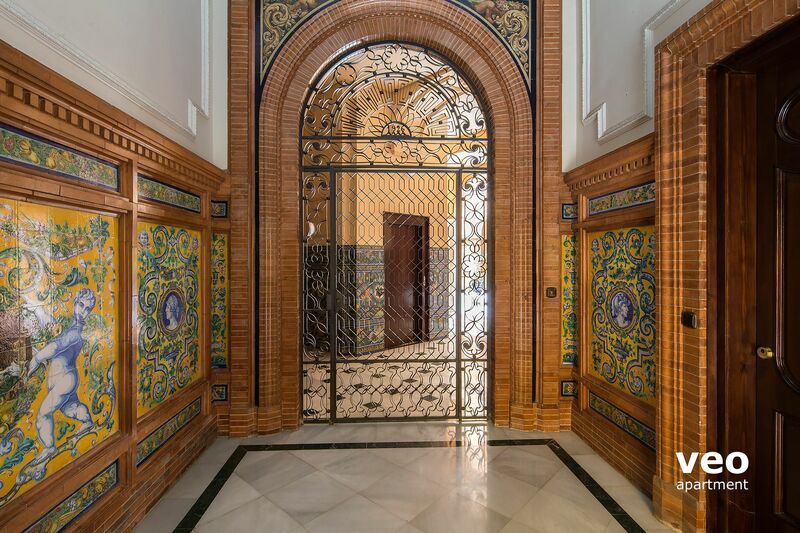 Ideal para una pareja que quiera estar bien situado en el centro de Sevilla. La cocina no está bien equipada en el tema de paellas y sus respectivas tapadoras. Solo hay una, pequeña y sin tapadora. Los otros utensilios son adecuados. "Sehr schönes, zentral gelegenes Apartment"
Wir haben die Zeit in dem Apartment sehr genossen. Zentral gelegen mit einer tollen Dachterrasse kann man sich nur wohl fühlen. Für einen Städtetrip hervorragend geeignet. Die Ausstattung des Apartments ist in Ordnung, für große Kochveranstaltungen ist die Küche zu klein, aber wer nicht in den unzähligen Tapas-Bars essen geht, ist selber Schuld. Wer den Herd trotzdem benutzen will, hier ein Tipp: Herd auf Stufe 1 stellen, dann heizt er in höchster Stufe, bei den anderen Stellungen wird der Herd nicht richtig heiß - wichtig für den Kaffee am Morgen (Stand Ende Oktober, kann jetzt aber auch schon repariert worden sein). Ansonsten .... genießt den Aufenthalt, morgens zum Frühstück auf der Terrasse und abends zum Sonnenuntergang ebenfalls ... ach, fast vergessen, man hat sogar von der Terrasse einen Blick auf die Giralda!!! 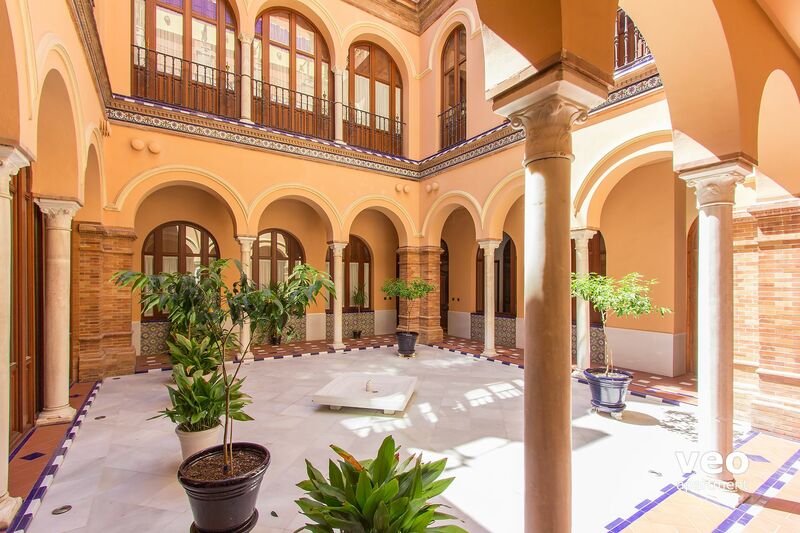 "L'appartement parfais pour visiter Seville à pied." Très beau appartement en plein coeur de Séville. Très propre, bien équipé, belle terrasse, bien accueilli, bref parfait. A good location and the apartment was comfortable. Traumhafter Ausblick von der Dachterrase über die Dächer der Altstadt. Anfahrt mit dem Auto sehr abenteuerlich, man sollte vom Parkhaus mit dem Taxi hinfahren und nicht erst das Gepack in die Wohnung bringen. Bei der Abreise haben wir es dann so gemacht. "Le plus, une terrasse super agréable"
Appartement très bien situé. Accès avec ascenseur. Magnifique patio. La terrasse est un plus avec la vue sur Séville. Rien à redire sur le confort et la propreté. Convient pour deux ou quatre personnes. 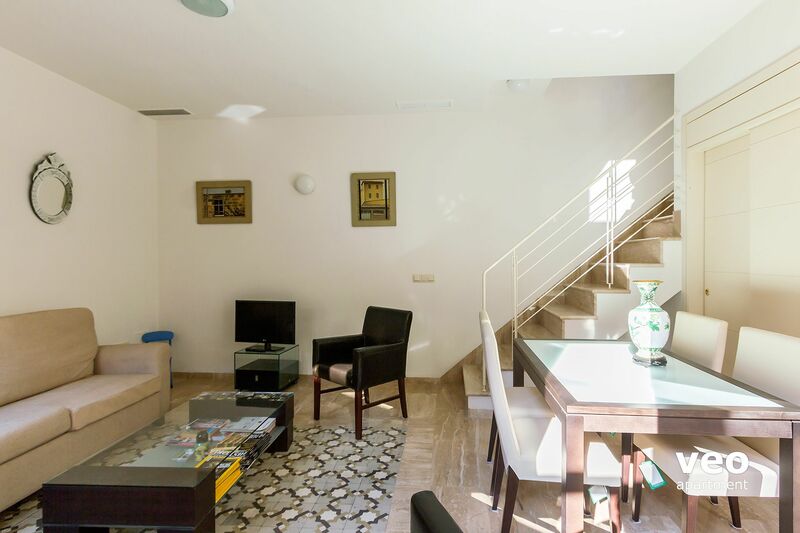 Good location, really nice apartment with roof terrace in stylish block. Spiral stairs to roof can be a bit scary and need careful attention. "Great apartment! Sunny and cozy on the roof terrace; quiet in the countyard building, living room and bed room." We had a lovely stay in the apartment for one week in November. Perfect location - easy to walk to anywhere in the city centre; surrounded by attractions, shops, restaurants and supermarket etc. 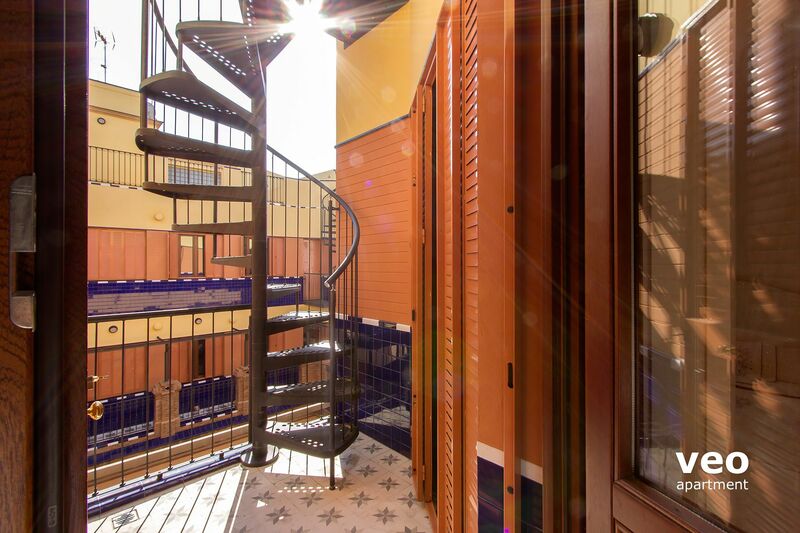 The choice is all yours: enjoy upbeat of the city or spend it quietly under the warm sun on the roof terrace. 1st week of November the weather in Seville was perfect: 15-25 celcius degree and no rain at all. Ideally it would be good if English language TV channel is provided. Also I ended it up buying a bigger cooking pan in order to prepare soup for dinner. For the rest, a highly recommend apartment as it does offer almost everything for a comfortable stay. The Apartment owner has been thoughtful to arrange them available providing convenience of the daily life. THANK YOU! Owner's reply: Dear guest, thank you very much for your stay and feedback in our apartment. Following your recommendations, we have bought further cooking utensils for the kitchen, and have installed TV via cable with English channels. Thank you for helping us to improve our services. Best wishes. Fidèle au descriptif internet, propre, bien tenu. Accueil et explications professionnelles à l'arrivée. Terrasse privée et avec vue sur Séville très agréable. L'ensemble des prestations est très bon. Petit point d'amélioration : l'équipement de vaisselle et cuisine, quasi inexistant (pas de poêle, pas de verres à vins, pas de mugs, autant dustensiles utiles et pourtant peu onéreux en investissement). 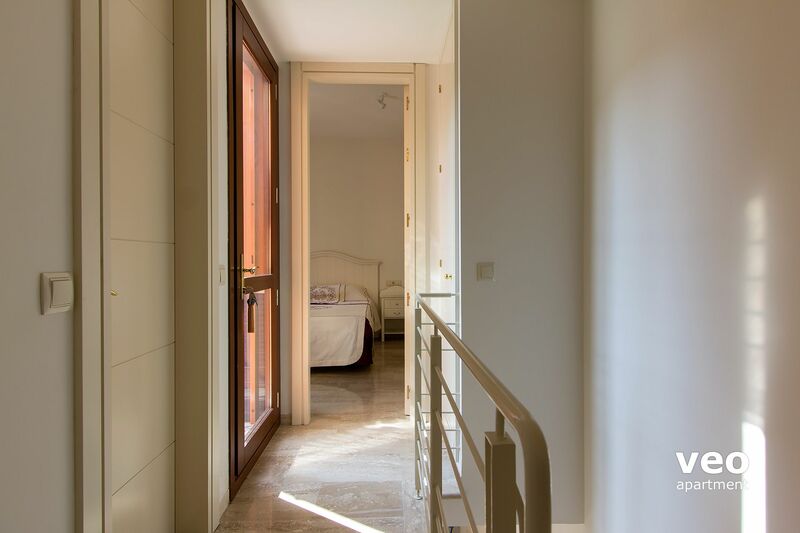 "Great location, superb view, scary staircase"
This apartment is in a lovely building that has recently been renovated. The location is central to all the tourist sites, yet it is in a quiet street. The apartment is spacious, well appointed and very clean. We particularly enjoyed the roof terrace. The range of outdoor furniture meant we could sunbathe, as well as enjoy having a drink whilst taking in the fantastic view. Having said this, there were a few things about the apartment that could be improved, such as having a bread knife, supplying more than one wine glass, and having some TV channels in languages other than Spanish. One particular issue is that the cooker doesn't work as expected - turning the knob to the highest setting didn't work, while turning the knob to the lowest setting gives the highest amount of heat. This seems to be an ongoing problem, as when we phoned the agent, they were able to advise us about what to do. About the scary staircase ... I found going up and down the spiral staircase very unnerving, as it overhangs the side of the building. Although it's very safe and secure, it isn't easy to carry anything up to the terrace, and there is a risk of dropping something. In fact, we bought some plastic cups to use when we were on the terrace, and perhaps this would be useful (and safer) for the landlord to provide. 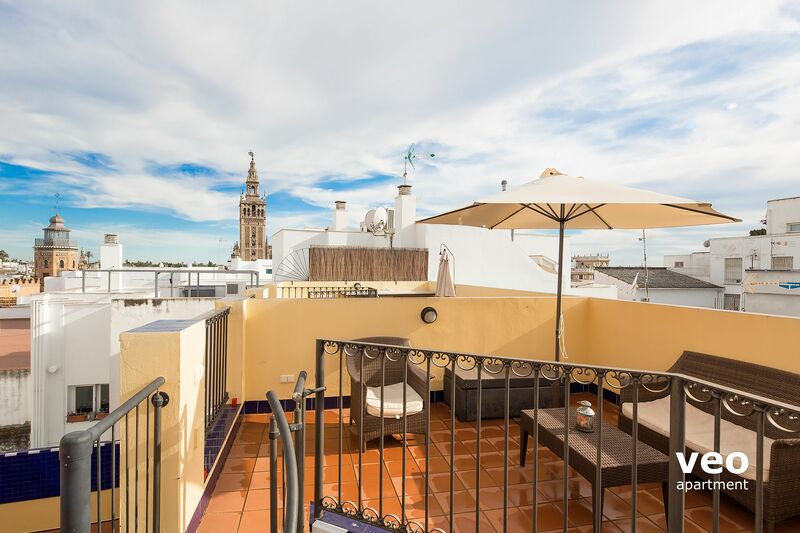 Nevertheless, I would definitely stay in this apartment again, not least because of the amazing view of the Giralda at night. Dear guest, First of all I'd like to thank you for your stay in our apartment. Following your recommendation, and as stated in other reviews, we have bought further cooking utensils for the kitchen, and have installed TV via cable with English channels. Once again, thank you for helping us to improve our services. Best wishes. 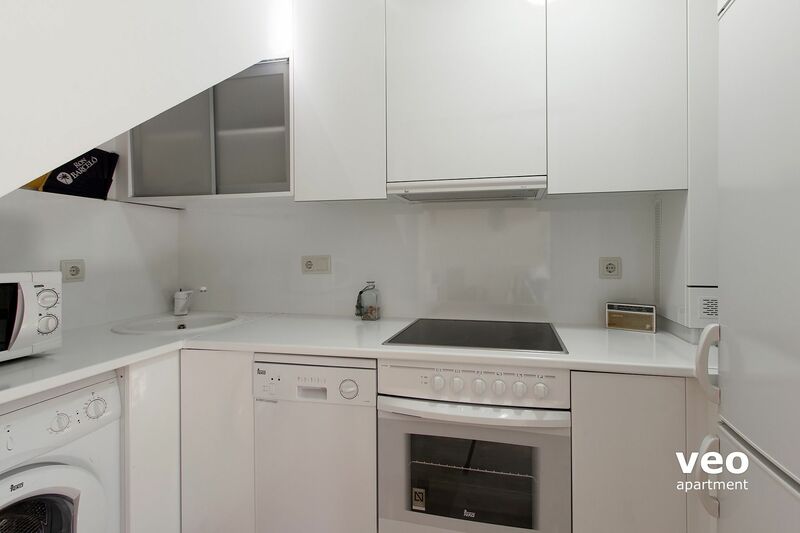 "Un emplacement idéal, le calme au coeur de Séville à 5 minutes de la Giralda"
Petit appartement parfait pour un couple, fonctionnel, très propre, idéalement situé. Le logement lui même est assez sombre - frais en été sans doute. Ce qu'il manque : des lampes de chevet dans la chambre, une bouilloire électrique et deux chaises longues sur la terrasse..
Two of us spent four nights there. The place is lovely with every comfort you might like except that I We think we must have been the first or second persons ever to be there the installations were so new. The result was problems in the bathroom--shower curtain collapsed and the marble floor was slippery with no mats whatsoever. These matters are easily taken care of but should have been before we arrived. 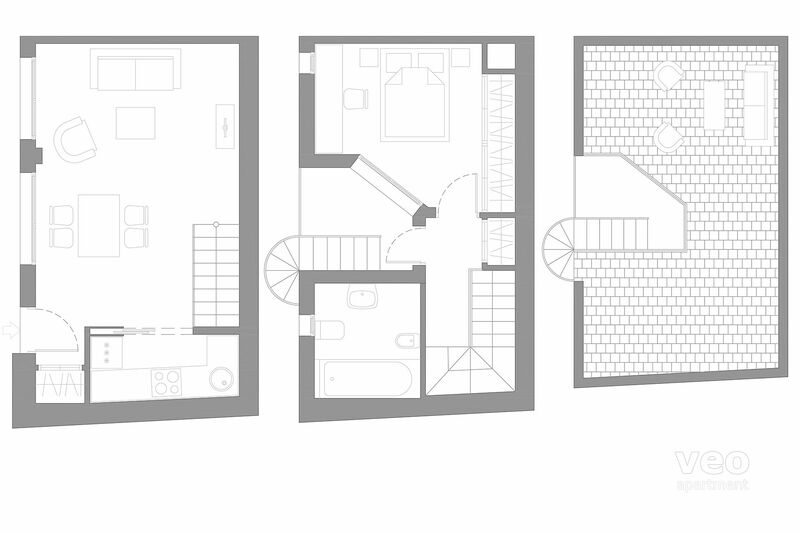 Also, the first floor is dark, but the bedroom upstairs though small is lighter and there is the terrace. Easy walk to the most visited sites in town and, to repeat, a lovely building. Owner's reply: Dear guest. First of all I'd like to thank you to choosing us for spending some days in Sevilla. I'd like to thank you your comments because those help us to improve our offer. The apartment orientation is east so it is very light in the morning and as you say we have the second floor and terrace receiving sun light 12 hours. We are trying to fix the slippery floor in the bathroom installing anti-slippery rug in. Thanks again for your comments and stay with us. Looking forward to see you again and receive our best regards.